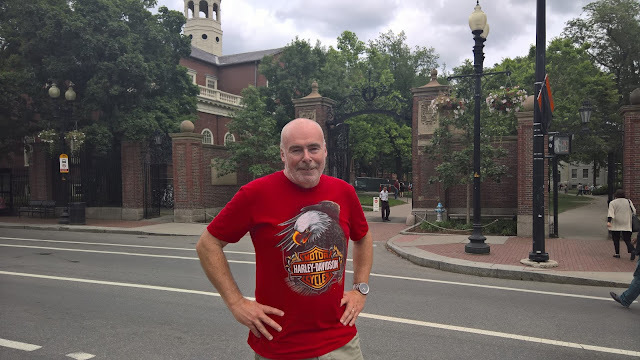 Today we paid a visit to one of the top universities in the World - Harvard. This is what other Colleges and Universities want to be when they grow up. Even though I myself have been an academic for quite some time, I did feel a bit overawed here today. The sense of history and brain power is everywhere - it was founded about 50 years after my own alma mater - Trinity College Dublin. The town of Harvard is lovely and friendly - it must be mad during term time. We took a tour delivered by a Harvard student who was both entertaining and informative. After this I went to the Boston Science Museum. This seems to be very much aimed at kids - I wish I was able to bring my own girls when they were young. The museum is brilliant with something for everyone. 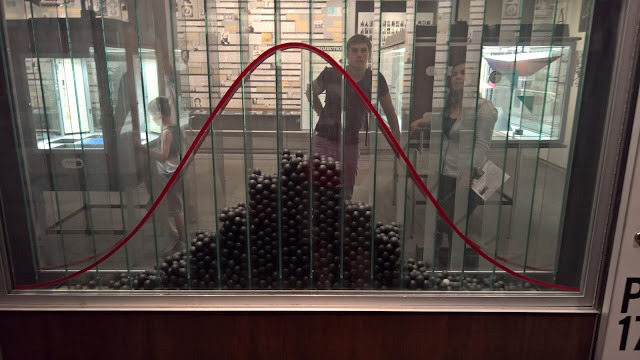 The highlight for me was finding a display about probability which include a live experiment where balls are dropping through a maze into boxes, which neatly result in a normal bell-shaped curve. I've inserted a photo below which I will replace with a video when I get home. I'll also now use this video in class! Probability at the Science Museum.